BOTTOM LINE Much to applaud in this dark Disney treatment of the Victor Hugo classic. As Disney musicals go, "The Hunchback of Notre Dame" is unusually dark, an almost operatic tale of lust and longing and revenge. It's a brave choice for the Argyle Theatre in Babylon, especially for the new theater's first holiday season when any number of safer, more family friendly selections were available. And while the piece is not without problems (clearly recognized by Disney, which never opened it on Broadway), the Argyle's production, helmed by artistic director Evan Pappas, has much to applaud. Based on the 1833 Victor Hugo novel, more a celebration of the French cathedral than its inhabitants, and the popular 1996 animated film, the musical's heart belongs to Quasimodo, the deformed, nearly deaf bell ringer played with deep conviction and powerfully sung by Colin Anderson. This being Disney, you get the requisite villain, the conflicted archbishop Dom Claude Frollo (Ryan Speakman), the dashing army hero Phoebus (Leland Burnett), and while there's no true princess, the fiery Gypsy Esmeralda (Gina Naomi Baez) is a mesmerizing force to which each of these men is drawn in an improbable, ultimately tragic, love quadrangle. 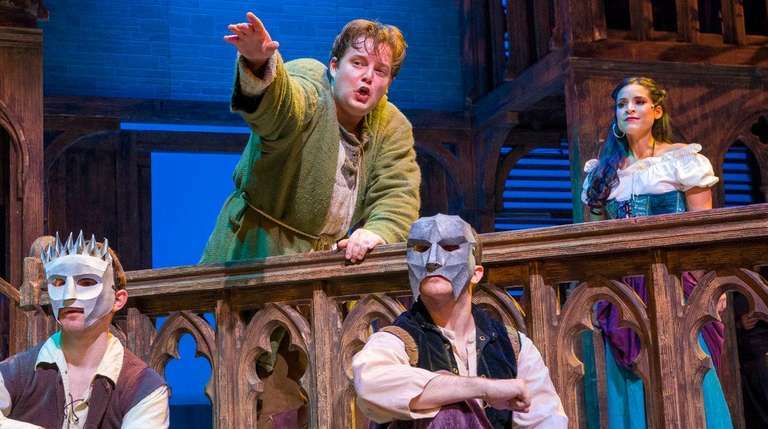 The ensemble is spot on when playing the congregants and Gypsies and, especially, the stone gargoyles who are Quasimodo's only friends, but when they speak directly to the audience to advance the narrative, it's more like an interruption. Much of the success of "Hunchback" rests on the score — music by Alan Menken, lyrics by Stephen Schwartz. While there's no hit along the lines of "Let It Go," the songs are lovely, notably the ecclesiastical choral work performed by a rotating choir of student singers from the Long Island Musical Theatre Festival. The production is striking, with a towering two-story set (Front Row Theatrical) representing the cathedral's bell tower, dramatic lighting by Graham Kindred and authentic costumes by Alan Berkoski. As in past productions, there were sound issues the night I attended, detracting from the overall production values. But no matter how gorgeous, the story is the driving force. As Pappas points out in his director's note, it's one that, despite its 19th century source material, has relevance today. Frollo's insistence on ridding Paris of the Gypsy band brings to mind immigration issues worldwide, Esmeralda has an obvious #MeToo moment, and who is Quasimodo if not a hapless soul bullied almost to death because he doesn't look like everyone else. So while this may not be your typical holiday fare, there is a valuable message of humanity's inhumanity, summed up best by the finale. "What makes a monster," the chorus sings, "and what makes a man?"